Wow! The Tracing Memories class on Jan. 12, from 9am to noon is now full. I am so happy that so many of you want to take this class! And, I like seeing that many of you around the country are also eager to take this class. If you are going to be in the L.A. area in January, don't despair, if you want to take this class. Due to the high demand, we have opened an evening session of the same class! Same date, same location, this evening class will run from 6pm to 9pm. Space is limited, and the morning class filled in a few days, so if you want to attend, register NOW! Visit our website and apply today! If you have been following my blog this year, you'll notice that I've been talking about our new program Tracing Memories. This program teaches you how to convert a photograph into an outline, then color it in while looking at the photograph. If this sounds exciting, and you think you'd like to try it, then you are in luck! I will be teaching a 3hr. introductory class in January. Anaheim, CA, January 12, 9am to 12pm. $35 Taught by Marianne Walker. Class will be held during CHA, but is not part of the convention. Class will be held at the Anaheim Red Lion Inn. With the Tracing Memories program, you will learn how to take your own photographs and turn them into custom works of art. 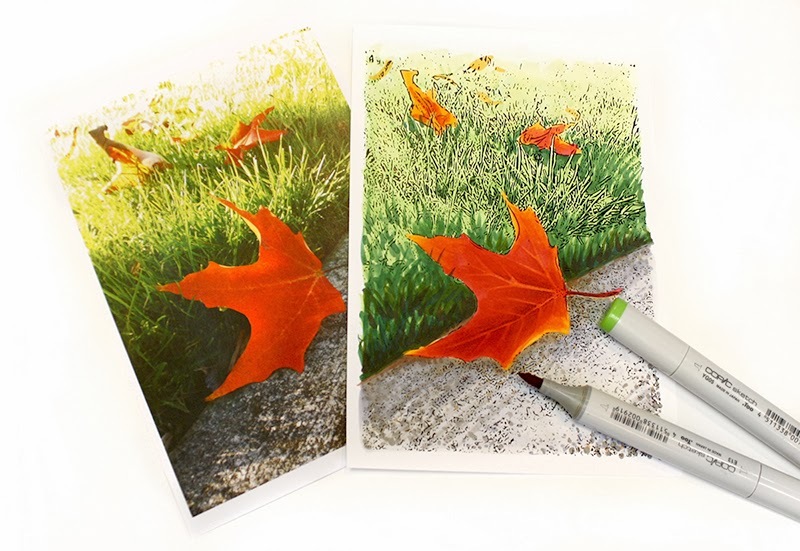 Start with an outline generated from a photo, then color it in using Copic Markers. Learn how to see and identify colors. Learn basic Copic marker blending techniques, while working with beautiful photographs on high-quality fine-art paper. This class is perfect for beginners and those who don't consider themselves artistic. Studies have proven that coloring and arts activities once a week helps relieve stress and promote relaxation at all age levels. But, a lot of the stress in fine-art comes with drawing the original artwork. With the Tracing Memories program, you convert your own photographs, so you don't have to draw. Choose images of your pets, your favorite vacation, or something you want to give as a special gift to a loved one. 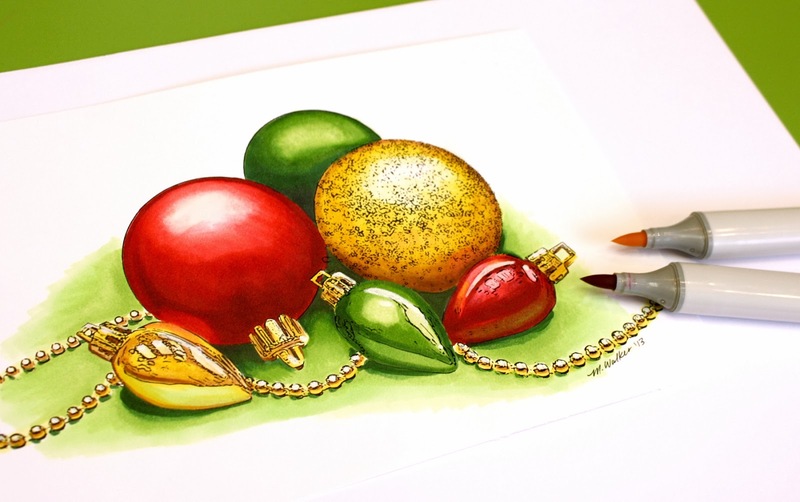 Coloring your own custom artwork helps you remember those memories, and creates a special picture that resonates for you. These make wonderful family gifts, or can be turned into cards, or printed as works of art. All supplies will be provided. You will leave with 1 to 3 completed images. Apply for this, and our other CHA classes HERE. This class is filling quickly, so apply soon! Also, If you are local to the Eugene, OR area, on Tuesdays through Nov. and December, I am hosting FREE Tracing Memories relaxation coloring sessions in conjunction with Sheldon Park Senior Community. Every Tuesday, Nov-December, 5:30 to 6:30pm. Free! Sheldon Park Senior Living, 2440 Willakenzie Rd. Eugene, OR (Near Sheldon High School). Everyone welcome! (I may not be at each session, but I will be at most of them). This week I will be at the annual U of O Tools of the Trade Show in Eugene, OR. University of Oregon Main Campus Bookstore, Downstairs in the art department. Come for a chance to win doorprizes, meet amazing artists and watch them work. There will be an amazing sale going on, and I will be there all day to answer Copic questions. Here's a drawing I was working on last year at that event. I drew the main black outlines with multiliners, then photocopied it onto nice paper. I then drew in the bunnies in the distance and the flying deck of cards with a gray multiliner. You can see how simply drawing things with a lighter outline creates the illusion of depth of field. Notice even the largest cards, up close, I drew with a light outline. When I color the things outlined in gray, I don't use the same intensity of colors as I do on areas outlined with black. Here is a photo of the finished piece. I really like how it came out (though this photo was taken during the event in poor light). 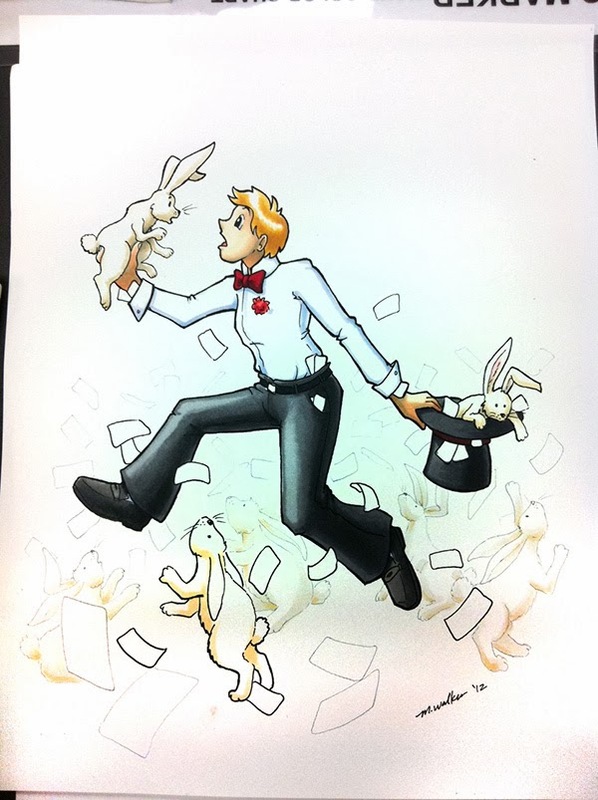 I like how you can clearly see the important bunnies, and the ones in the distance are not as prominent. Who knows what I will draw this year? I don't even know, so I am really looking forward to seeing what I come up with over the next few days! Also, our new classes I mentioned yesterday are now open for enrollment! We have already had some applications, and popular classes are already starting to fill. If you want to take one of our classes at CHA, you need to apply soon! You can find Workshop information and applications HERE on the Copic Website. You can find Standard Certification information and applications HERE on the Copic Website. You can find Intermediate Certification info and applications HERE on the Copic Website. CHA classes open this week! Stay tuned, as we have a lot of exciting NEW classes opening this week for Winter CHA in January. There will be classes in the days before the show opens and even a class during the show, so if you are working on your education schedule, keep these times open. Registration and full class details will be posted later this week on the Copic Website. The 2014 Color & Ink Workshop Series is a little different than 2013 classes, and you can register for each section independently, no prerequisites! All classes are held in Anaheim, CA at the Red Lion Inn, just a block away from the convention center and are NOT hosted by CHA or listed in the CHA program. Standard Certification, 8am - 4pm, $120 No Prerequisites! Artistic Mixed Media Apron class with Michelle Houghton, 5-9pm $60 No Prerequisites! Whimsical Faces & Hair Color Along, 8am - 1pm $99 No Prerequisites! Airbrushing, 2 - 6pm $99 No Prerequisites! Jan. 12th Alcohol Ink Painting 2pm to 5 pm $35 No Prerequisites! Again, Registration will open later this week on the Copic site, and I will post information as soon as it opens. See you in January at CHA!